"These risks are very close to those that characterise gambling addiction." 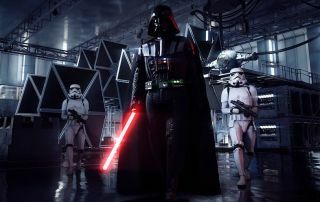 A French senator has contacted France's online gambling regulator detailing his concerns about the microtranactions in Star Wars Battlefront II. According to The Nerd Stash (via GameInformer), French senator Jérôme Durain contacted ARJEL (as well as other advocacy groups, including the organisation that represents France's games industry), proposing that loot boxes could be harmful to children. While he stopped short of advocating new legislation—and seemingly took time to praise "the advancement of gaming as a culture"—he did specifically cite Battlefront II's recent controversy as a point of concern, stating the correlation between an in-game character's strength and spending real-life money needed further investigation. In reply to the senator, ARJEL's Charles Coppolani stated that the concern he "had anticipated in 2016" presents "risks for our fellow citizens and in particular for the youngest. These risks are very close to those that characterise gambling addiction money; it is necessary to be very vigilant." He further suggested that adding loot crates are a "totally random product that amounts to introducing a paid lottery game into a game," and because "almost mandatory transactions [...] are added to the purchase price", it also potentially presented a consumer protection concern. This is just one in a line of high profile political statement about loot boxes, including Belgium's Justice Minister calling for loot box ban in Europe. Last week, EA told its investors that removing microtransactions from Star Wars Battlefront II would not have "a material impact" on the game's projected earnings after it announced it had temporarily suspended Battlefront 2's premium currency.